The run of middling performers at the box office continues as we bid goodbye to September, although a thematically appropriate for the time of year children's film is hoping to stand out from the pack. The middle film in the trio of pre-teen targeted “horror” animation that's come on like a sudden rash, Hotel Transylvania has without a doubt that largest amount of star power between it, ParaNorman and the upcoming Frankenweenie. 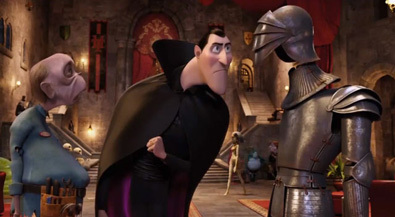 Adam Sandler stars as Dracula, who plays the protective father to his daughter by building a hotel in, well, you know, to keep the all the humans away. Monsters from all around the world also move in to give themselves a safe space – that is, until a backpacking American tourist (voiced by Andy Samberg) stumbles in and engages in mutual smittance with the daughter (voiced by Selena Gomez). Wackiness and monster cliches ensue, to the merriment of all, or maybe some. As hackneyed and sitcomy as this premise feels, it does have some genuine talent behind it, in the form of Genndy Tartakovsky, the legendary animator behind Dexter's Laboratory, Samurai Jack and the Powerpuff Girls, among other things. I'm not certain that'll actually drive business, but it does show that we're dealing with someone who knows what his target audience wants. A guy dressed as Frankenstein surfing around a castle? Sounds right up a 12-year-old's alley. So as execrable as some of the ads for this seem, well, it's not for you, you know?